The application interface provides quick access to all the important features of Digital Media Converter Pro. The Menu Bar gives you full access to every feature in the program. Add the files from your PC or from the web for conversion from the Tool Bar. You can select the standard conversion format or an output device format for converting your media files. Add various effects to your output video to improve the viewing experience. You can split a file and add just a part of it for conversion. Monitor a folder for a new media file and schedule the conversion process. 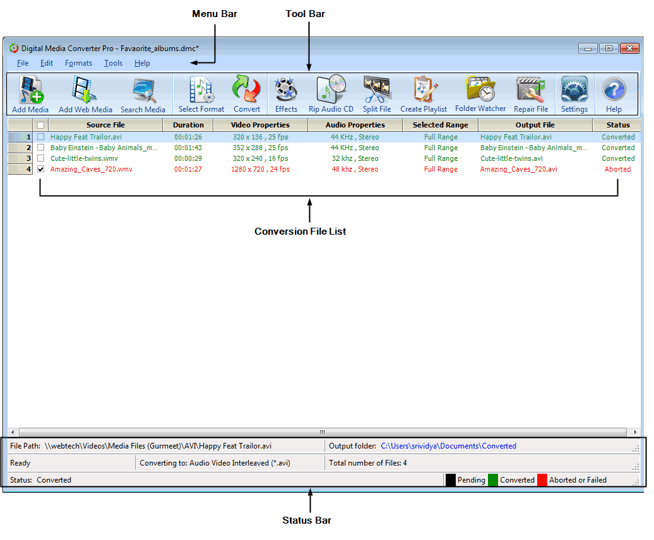 The files added for conversion are displayed in the File List. These files are displayed along with the duration, audio and video properties, the range of the file, output file, and status of conversion. The status can be Aborted, Pending, or Converted. At the bottom of the application is the Status Bar. It displays the progress of the conversion, total number of files in the list, and status of the file whether it is converted, aborted, or pending. In addition, the path of the input file and a link to the output file is displayed. The format in which the file is being converted is shown.